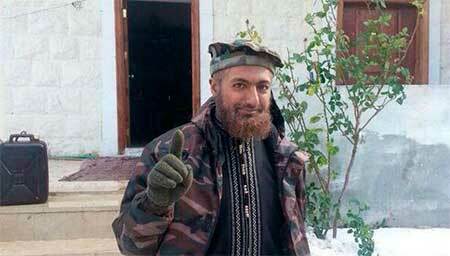 The Progressive Gazette: US Guantanamo detainee killed in Syria while leading NATO-backed death squad. US Guantanamo detainee killed in Syria while leading NATO-backed death squad. Ibrahim Bin Shakaran, a Moroccan who spent more than three years at the Guantanamo Bay detention facility before being released to Moroccan custody, has been killed while leading a jihadist group that fights Syrian government forces. Bin Shakaran, who is also known as Abu Ahmad al Maghribi, Abu Ahmad al Muhajir, and Brahim Benchekroune, was “martyred, Insha’Allah, in battles for Hilltop # 45 in Latakia,” according to Kavkaz Center, a propaganda arm of the Islamic Caucasus Emirate. Sham al Islam has been fighting alongside the al Qaeda’s Syrian branch, the Al Nusrah Front for the People of the Levant, as well as Ahrar al Sham and the Army of the Emigrants and Supporters in an ongoing offensive in the coastal province of Latakia. Curiously absent from The Long War Journal’s report is any mention of how Bin Shakaran made it into northern Syria in the first place. Clearly this is because it would involve mentioning Turkey, a long-standing NATO member, with NATO being the organization that invaded and occupied Afghanistan, and whom Bin Shakaran had been fighting and ultimately fled from before being captured.